(hat tip, Anthony Watts). "Low temperature response" means what people like me have been saying: the atmosphere does not warm as fast as the alarmists say. Sigh, yet another computer model simulation. You know the same ones that completely missed the 15-year "pause" in global warming and have missed the current cooling in global temperatures? But, at least this model is HAPPI (good grief!). This paper smacks of desperation by Big Climate. Now that their 30-years (as of next month) of contentions and "tipping points" that disastrous weather/climate is always just over the horizon, they are trying to find something else to keep the gravy train rolling down the track. It is past time to cut U.S. climate research back to a more reasonable level. Carbon dioxide concentrations have risen considerably since the 1950's (when they were first systematically measured worldwide). However, there is no trend whatsoever that people are dying in greater numbers as result. #1. The medical evidence shows more than twelve times as many people die from cold as from heat. Warmer temperatures = fewer total deaths. #2. According to the paper in question, more CO2 means more tropical storms. 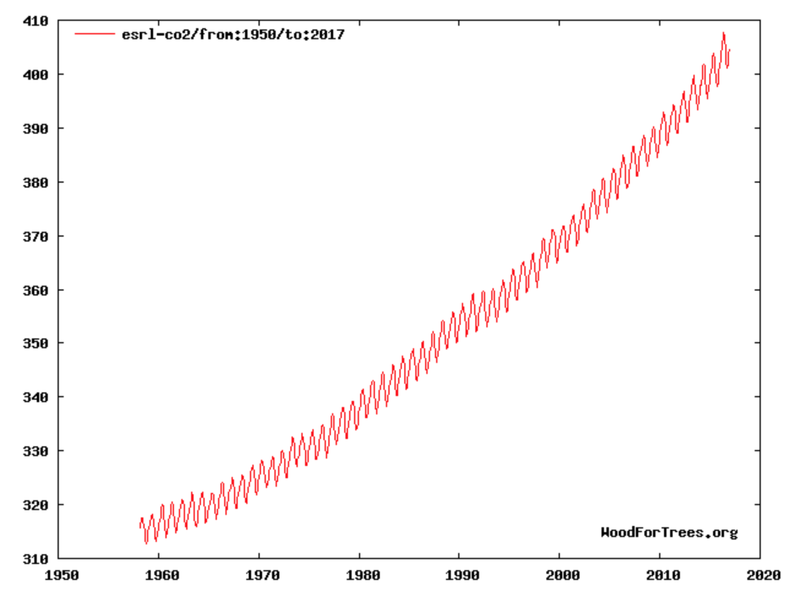 You can see the increase in CO2 (red curve above) has increased since 1970 but there is no increase in tropical storms or hurricanes. Oxford and the others could have figured all of this out by looking at genuine data (as I have here) instead of a "simulation" of the future. Of course, that would have falsified their research and would have further jeopardized the gravy train.